The Sassoon Gallery is a nicely converted space in a railway arch under Peckham Rye station (train or bus is much the best way to travel there), in an enclosed yard which is reached by walking through a bar, Bar Story, in Blenheim Grove. 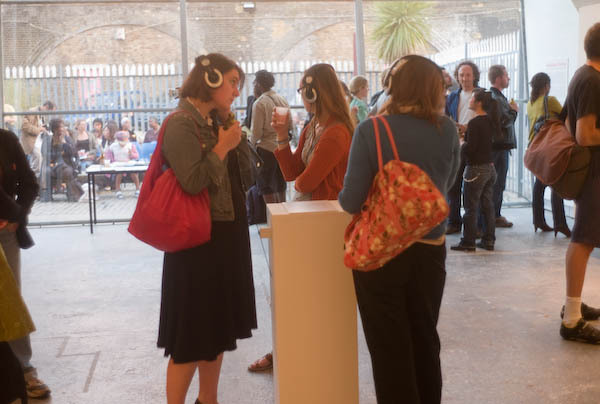 Peckham Rising is only on show until 9 Sept, so get there fast (open noon-6pm.) 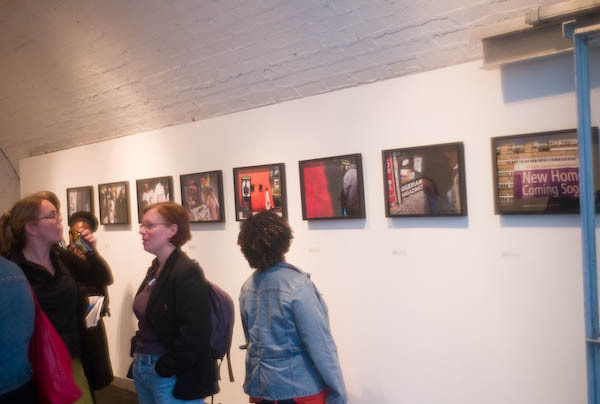 It is a show curated by Paul Goodwin, a research fellow at the Centre for Urban and Community Research at Goldsmiths in nearby New Cross, as a part of his ‘Re-visioning Black Urbanism’ project. 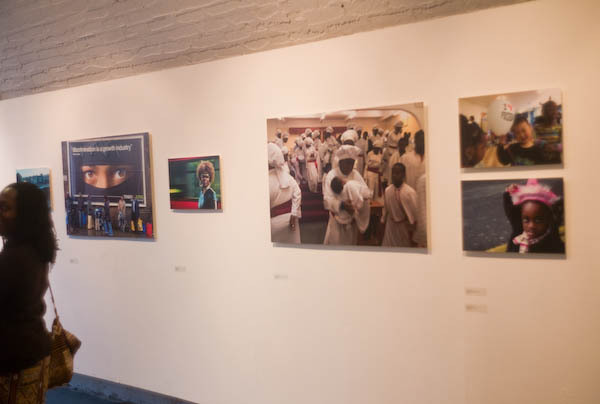 It includes work by three artists, photographs by Thabo Jaiyesimi and Daniele Tamagni and a sound piece by Janine Lai. Thabo’s series of eight images taken on the streets explore some of the issues and cultural richness of the area, often using vivid and emotional colour. A sign for housing in front of a locally notorious block of flats, shop fronts making the link to Nigeria, and another image with a black woman making a phone call tell of the distant roots of many in the area. 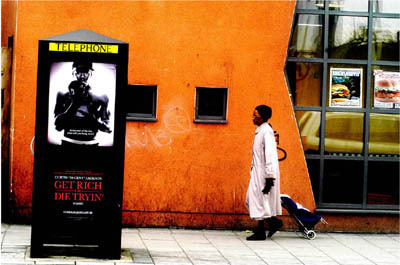 A crowd bustles in front of the bus from central London, a black woman in a white coat pulls her shopping trolley in from of a bright orange wall and a telephone carrying a advert for the 2005 film ‘Get Rich or Die Tryin’, a partly autobiographical movie in which Curtis “50 Cent” Jackson as ‘Marcus’ plays a drug dealer who aspires to be a professional rapper. For me the most interesting image was one taken on the recent protest against gun crime in Peckham. Thabo’s flash lights up a pink glove pointing at the poster on a man’s chest reading “MURDER £20,000 reward”. The black girl’s finger points as she reads the smaller print, but reads like a gun. You can see more of his work on his web site. I talked to Italian photographer Daniele Tamagni about his work in Peckham, and he showed me a newspaper feature on his previous show of pictures taken in black churches in Peckham. The large image from this project on show at the Sassoon was an extremely striking picture, a sea of white-robed figues with a woman in the foreground coming towards the photographer cradling a baby. The only white face in the image, carefully framed between the figures, is a statue of Jesus, arms outstretched on the wall at the front of the church behind the people. Although there were a number of interesting images in his work, overall I found the selection too disparate, and at the same time too small to represent the multiplicity of Peckham. I would much rather have seen a more focussed display of his work – such as that on the churches or another project Tamagni has done on hairdressers in the area. The voices recorded by Janine Lai, who works at Peckham Library presented an interesting kaleidescope of views from Peckham residents, although I found the presentation difficult to follow, trying to listen to two people at a time. It will also doubtless work rather better during the rest of the show than at the opening, with only three sets of headphones available. Perhaps for the opening it could have been put through a loudspeaker? Perhaps the hardest part of the show for me were the texts by the curator, Paul Goodwin. In so far as I could understand the rather obscure language that is apparently a prerequisite for academic credibility, I think that he seemed to be promoting a rather uni-dimensional view of Peckham that is as limiting in its different way as the media stereotypes which he seeks to confront. 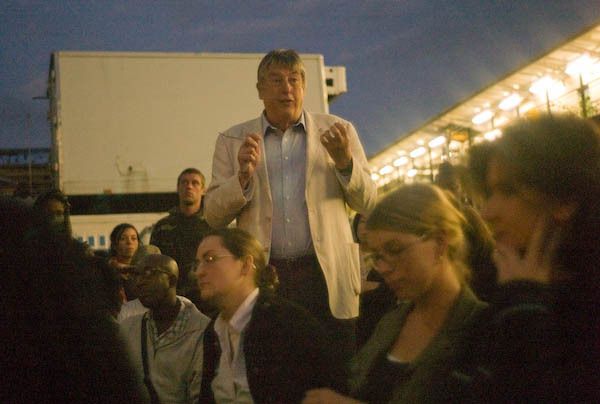 But Goodwin’s intention is, at least in part, to promote dialogue, and both the show and the lively ‘Peckham Regeneration debate‘ that took place during the opening showed a more cosmopolitan Peckham than emerges from the apparently simplistic viewpoint of black urbanism. It is an interesting show, although I’m not quite sure why, according to ‘Myspace‘ it is Female and 47 years old! You can see more of my pictures from the opening, (shot with a Leica M8 and a 35mm f1.4 lens that can almost see in the dark) on ‘My London Diary‘ shortly. They include images of the speakers at the debate, more of the installation and some pictures of the photographers I met at the show. The Sassoon name is one with an interesting Peckham connection. The Sassoon family were Sephardic Jews, descendants of King David, and were some of the first Jewish settlers in Bagdhad, where they became courtiers and wealthy businessmen. But it was only in the nineteenth century that David Sassoon established a great empire trading with India and the Far East, and sent one of his son’s to open a small outpost in London in 1858. After his death, the family, sometimes referred to as the Rothschilds of the East, largely moved to England. 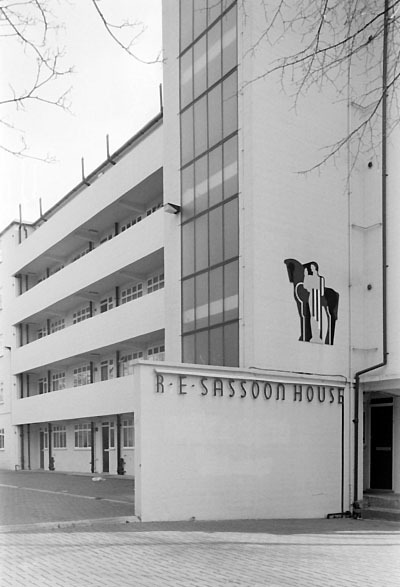 In 1932-3, the incredibly wealthy widow of Meyer Elias Sassoon, Mozelle Sassoon, engaged architect Maxwell Fry to build Sassoon House, his first modernist work, a still striking block of working class flats in St Marys Road, Peckham, as a gift to the Pioneer Housing Trust in memory of her son, R E Sassoon. Mozelle was the great aunt of Siegfried Sassoon, although he first met her in 1914 when he was in his late 20s. His artistic talent probably came mainly from his mother’s side, where hordes of the Thornycroft family – including many talented women, were well-known as sculptors and painters in the 19th century – as you go over Westminster Bridge you pass Thomas Thornycroft’s ‘Boadicea and Her Daughters.’ But probably the best-known Sassoon now is hairdresser Vidal, who, so far as I know, is without links to Peckham (although his Greek-born father’s family had its origins in Iraq) and was born in poverty in Whitechapel. This entry was posted on Tuesday, September 4th, 2007 at 04:13 pm and is filed under My Own Work, Photographers, Political Issues, Reviews etc. You can follow any responses to this entry through the RSS 2.0 feed. You can leave a response, or trackback from your own site.